By learning to play One Love by Bob Marley and the Wailers, you'll not only be learning to play a great song, but also learn about playing rhythm guitar in the reggae genre. It's a very laid back, cool way to play music, ala Bob Marley, so hope you have your guitar ready. 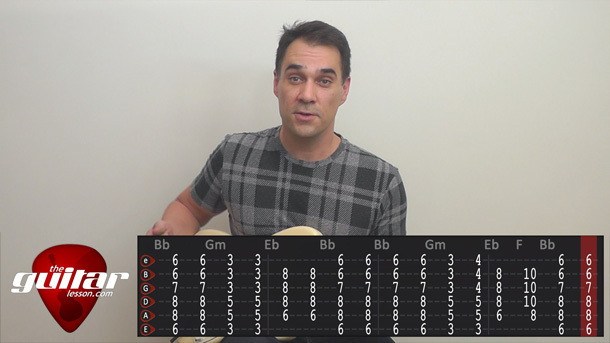 We'll be using barre chords throughout this entire lesson, so it'll give you a great chance to practice your barre chords and changing in between them. First of all, we'll be learning the reggae groove, and the role of the guitarist. With this genre, the rhythm guitarist will strum any given chord on the & of every beat (aka off beat). It's important to strum down, not up. These reggae strums are more like chops, in that they are abrupt and end quickly (staccato). I'll show you the exact method of doing the chops in the video tutorial. After learning the chorus, we'll learn to play the verse to One Love. The rhythm is the same as before, and we'll be using the I, VI and V chords. At the end of the lesson, I'll show you how easy it is to transpose the song to a different key, the key of C to be exact. One Love was originally released in 1965 by Bob Marley and the Wailers, and was played in a ska style. Later, it was reworked to become a reggae song, which is the version most of us know today. The lyrics behind the song reflect on Bob Marley's view on life, that everyone in the world should get along and become one. One Love was musically influenced by another song called People Get Ready by The Impressions, and after 1977, to enforce copyright, One Love was renamed One Love/People Get Ready. The posthumous music video of the song was released in 1984, 3 years after the early death of Bob Marley. It went on to reach the #5 position on the UK Top 100 in May, 1984. Sorry, but you've reached a premium content area. The download of the One Love tablature file is only available to premium members. Sorry, the same goes for the backing track. To download the backing track to One Love, please log in and revisit this page.